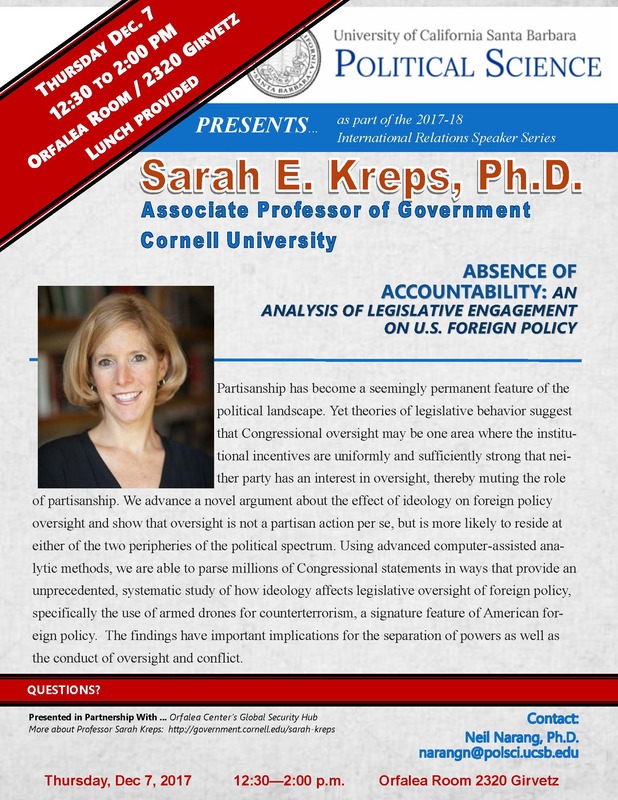 International Relations Speaker Series: Sarah Kreps, Ph.D.
Partisanship has become a seemingly permanent feature of the political landscape. Yet theories of legislative behavior suggest that Congressional oversight may be one area where the institutional incentives are uniformly and sufficiently strong that neither party has an interest in oversight, thereby muting the role of partisanship. We advance a novel argument about the effect of ideology on foreign policy oversight and show that oversight is not a partisan action per se, but is more likely to reside at either of the two peripheries of the political spectrum. Using advanced computer-assisted analytic methods, we are able to parse millions of Congressional statements in ways that provide an unprecedented, systematic study of how ideology affects legislative oversight of foreign policy, specifically the use of armed drones for counterterrorism, a signature feature of American foreign policy. The findings have important implications for the separation of powers as well as the conduct of oversight and conflict.